The following appears in "History of Passaic and Its Environs" by Walter W. Scott, Vol. III, published by Lewis Historical Publishing Company, Inc.., New York, 1922 located in the Passaic Public Library, Passaic, New Jersey. John Duffus, son of John Henderson Duffus of Dundee, Scotland and referred to above, was born at the family home in the city of Dundee, October 11, 1840. Having been left as an orphan at a tender age, his first ten years were under the care of his foster mother, and thereafter under the care and sympathy of a step-mother, after the second marriage of his father. His early educational training was acquired in the schools of his native city, and while in yet his boyhood years he developed a desire and longing for a seafaring life, which had been graphically pictured to him by his uncle, George Duffus, who had himself been a seafaring man for many years. The boy, having seized upon the first opportunity that presented itself, arranged for a trip to a foreign port on one of the vessels leaving the port of Dundee, thinking that from that time in his life would be one of possible romance and adventure. An experience, however, after six months on board a trading vessel largely dispelled his illusions, and he yielded not reluctantly to the solicitations of his father to return home and enter high school. Soon after his return to the parental roof, and after laying aside his school books, he decided to learn the art and technique of the carpenter and at once entered upon his newly chosen work. This, however, did not prove entirely congenial to his tastes and expectations; he developed a desire to enter into missionary work and service of the Cross. He discontinued his chosen avocation, and assiduously applied himself to the preparation for entrance to college, and in due time was admitted to Bedford College, England, where in the course of time he became a proficient scholar, and after his graduation preached his first missionary sermon in Ward Chapel, in his native city, where he had formerly worshipped in his early boyhood days. His ambition was to follow in the footsteps of such men as Livingston and Moffat, and he accordingly lost no time in applying to the London Missionary Society for an appointment, and in the due course of time was sent to the Island of Madagascar. In entering upon his newly chosen work, he applied himself to the duties thereof with enthusiastic devotion, having mastered the native language in about one year. This greatly increased the scope of his influence among the people of the Island which might have developed to a considerable degree had not an event occurred which changed the whole course of his life. The new King had just come to the throne of Madagascar who for a time was the idol of the people, for he had inaugurated many reforms of a civic and religious character. Unfortunately, however, the King was surrounded by evil advisers, who soon let him into dissolute habits. This had an alarming effect upon the better element of society on the Island, which besought the King to relinquish his evil associates, and to abrogate the treaty, which they had induced him to make with France. 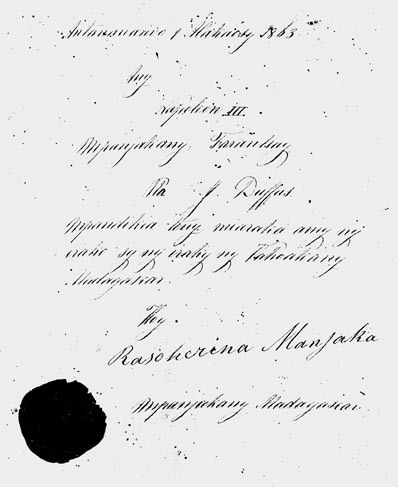 The French Government received Rosoherina's representatives with icy coldness, and plainly intimated to them that their presence on French soil was unwelcome. In England they were courteously received, were entertained by nobility, and introduced into various diplomatic circles, and were also presented to Queen Victoria at Buckingham Palace. Nevertheless, the British Government refused to intervene in their behalf with the French Government. 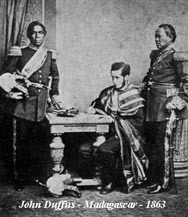 The failure of their mission was a sore disappointment to the Madagascar representatives, for they well knew that censure, if not vengeance, awaited their return to Madagascar. Mr. Duffus, as a member of the Mission, realizing that in his own case at least, discretion might prove the better part of valor, took leave of his associates at Suez, and returned to England as a private citizen. A few months later, John Duffus decided to sail for America, and immediately upon his arrival here traveled throughout the various states before permanently settling in the then fast developing town of Passaic, New Jersey, where he found favorable opportunities for advancement. He accordingly engaged in the real estate and insurance business, having met with a marked degree of success from the beginning. His reputation and influence soon became recognized by his fellow citizens, and he was elected to the office of city clerk, and also that of justice of the peace. Mr. Duffus later settled in New York City, where he had been a resident for a period of over twenty years, and there engaged in clerical work. During his spare hours he occasionally contributed articles to the public press, and in the course of time became noted as a writer of lay sermons. He frequently, while in a reminiscent mood, lamented the fact that he did not re-enter the ministry when he returned to England, and could have carried the message of salvation to some heathen land. In his church connections, John Duffus was broadminded, and was entirely free for servility of creed or form. During the many years of his active life he held membership with several church denominations, but singularly enough, he had with his devoted wife, for the past six years been members of the Broadway Tabernacle, thus ending as he began in the Congregational faith. It can be correctly stated, however, that through all the vicissitudes of his life his faith in God never wavered. John Duffus had twice married. His first wife, whose maiden name was Georgie Mott, was born August 31, 1845, died October 10, 1880, the daughter of Benjamin and Louisa Mott, of Long Island. Of this union were born two sons, John R., and George S, of whom further. He married (second), his wife having survived him at the time of his death, which occurred February 20, 1912, in the City of New York. John Henderson Duffus, on January 4, 1885. 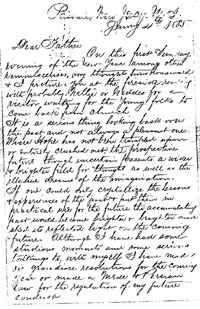 For the Reverend John Duffus' 1838 Journal click here! John Denis Duffus was born September 26th 1933 and educated at Boorhaman State School and then at Xavier College, Kew from 1944-1951. He then studied pharmacy, qualifying in 1954. He then entered Corpus Christi College, Werribee, to study for the priesthood. Fr. John Duffus was ordained at St. Patrick's Wangaratta on 21st July, 1962 by the Most Rev. Dr. Bernard Stewart, Bishop of Sandhurst. Fr. John Duffus was curate at Kennington, Benalla and Wangaratta after which he spent seven years teaching at Alexeshafen and Port Moresby seminaries in New Guinea before studying again in Washington, D.C., U.S.A. and Rome before returning to be Bishop Stewards secretary and assistant. When Bishop Slewart retired, Fr. John Duffus continued to assist Bishop Noel Daley in the same position at the Sacred Heart Cathedral, Bendigo. Fr. John Duffus was elevated to the title of Monsignor "Prothonotary Apostolic" by Pope John Paul II on Sunday, 7th July, 1991. © 2003 David Duffus. All rights reserved.